I visited Attingham park today, as I had finished sooner on some work in nearby Shrewsbury, and because have a family membership to the National Trust though I would just have a quick look around. Prices are Adult £11.10 Child £5.50 & Family £27.70 This is for the whole Property. Though if you only want to go round the park and walled garden only prices are Adult £5.90 Child £2.95 & Family £14.75. If national trust member this is included in your membership price. Car parking is free for everyone. For Latest prices and opening times see official website HERE. To get to Attingham Park from the main road is a very long drive way to get to the car park, but you are surrounded with lovely views of the park and the Mansion. The House itself dates back to 1782-85. Though the whole site had activity for over 400 years including Iron age field system, Bronze age barrows and also Roman influences. Today there is nearly 4000 acres of land. There are loads of different walks around the estate, I would recommend getting a little guide to the parkland walks as some are long and some on even ground. I decided to go on the Deer park walk which is approx. 2miles. Though you could deviate from this into the woodland walk or bluebell walk. The shortest is the mile walk. On the walk I went into the walled garden at this time of year not that much in there though in the coming months looks like it would be very beautiful. By the walled garden is also a playing field with swings, climbing frame etc for the kids. In the summer months there is also a little hut for refreshments. The walk took me to the suspension bridge that was installed in 2008 to replace the old bridge over the river Tern. I went through loads of lovely woodlands and you could hear was teaming with wildlife as you could always hear the birds singing. Just before you get to the deer park there is the Berwich memorial, this is for Thomas 8th Lord of Berwich who gave the estate to the national trust in 1947. As I was making my way through the deer park seemed very quiet and though I wouldn’t see any deer, but just has heading towards the house, there they all was just lying in the grass, I must have seen at least 40-50 deer. I could get pretty close at only about 20 yards way. I love seeing deer and these were very beautiful. I spent a good while just watching them eat and just lying there. Just after going over the weir towards the house there is the ice house this is an underground chamber for storing food. From this side of the house you have great views of the building and really do look impressive. Going into the mansion is a very impressive entrance hall, as usual in each of the rooms there are very knowledgeable people from the nation trust that will explain in full detail about the history of the room and any items within it. As I was only having a quick visit I didn’t spend as long as I would have liked looking around and finding out the full details of the history. Though at the moment there is loads of work going on to repair the gallery ceiling that is made of cast iron and glass. That I was told even after first being installed all those years ago as always leaked. The repairs to the outside are costing approx. 1.4 million, then once that is done the interior requires more work. This will not be fully completed until nearly 2016. Though this doesn’t make it any less worth visiting as this really only affects the gallery room all other rooms are fully accessible. As this visit for myself was just a quick visit to both the grounds and house I didn’t spend as much time as I would have liked and think we will visit again as there is so much to see and do and in the coming months when the flowers and foliage start growing will look amazing. 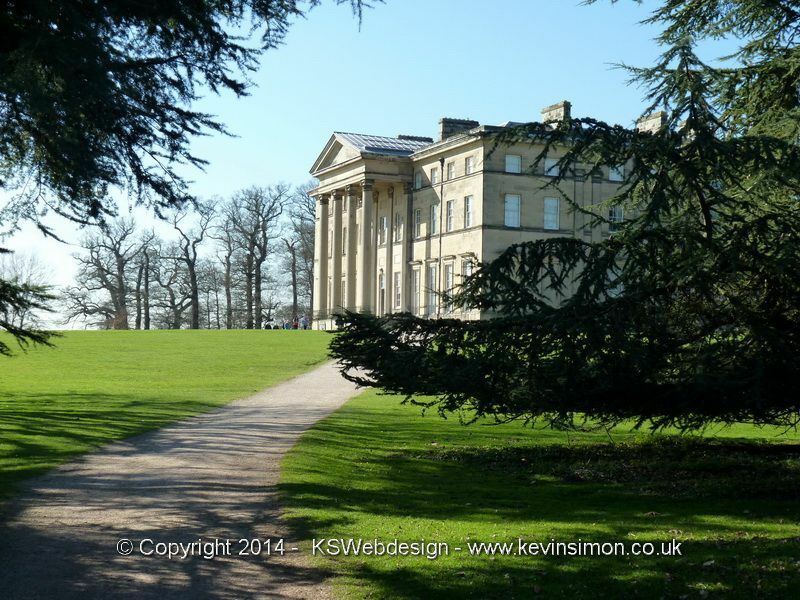 Though in only the few short hours I spent around Attingham park I really did enjoy it and seems to be great for all the family as there is something for everyone, even if you just want to walk your dog around the grounds. When we go back will update this article with more info and photos. Also if you are in this area why not go to the Wroxter Roman Ruins, which is really just down the road, I visited a few years ago and was great place to visit see HERE for details.